Rice bran oil has a very high smoke point, so it’s a perfect oil for searing and stir-fries where that high-heat seared flavor is desired. You can make this dish with any type of rice, but I love the red rice I’ve been finding in whole-foods stores, whether from Thailand or Bhutan. 1. Heat a 14-inch wok or large, heavy skillet over high heat until a drop of water evaporates upon contact. Swirl in the oil and add the onion, carrot, tofu and mushrooms. Stir-fry until the vegetables are crisp-tender and the tofu is lightly colored, about 2 minutes. Add the garlic and chili, stir-fry for no more than 10 seconds, and add the spinach. Stir-fry until the spinach wilts, season to taste with salt and pepper, and pour in the beaten egg. Stir-fry until the egg is scrambled, and add the rice. Cook, scooping up the rice with your paddle, then pressing it into the pan and scooping it up again, for about 2 minutes, until the mixture has a nice seared aroma. Add the fish sauce or soy sauce and chopped scallions, stir together for about half a minute, and serve, passing the optional garnishes. Advance preparation: Cooked rice will keep for 3 to 4 days in the refrigerator. The dish is a last-minute stir-fry, but the ingredients can be prepared hours ahead and refrigerated. This classic Italian dish must have hundreds of versions, all resulting in a rustic braise of chicken, aromatic vegetables and tomatoes. My version includes lots of mushrooms, both dried and fresh. You can add kale to the dish if you want to work in some leafy greens (see variation below). 1. Place the dried mushrooms in a bowl or heat-proof glass measuring cup and pour on 2 cups boiling water. Let sit 15 to 30 minutes, until mushrooms are softened. Drain through a strainer lined with cheesecloth or a paper towel and set over a bowl. Rinse the mushrooms in several changes of water, squeeze out excess water and chop coarsely. Set aside. Measure out 1 cup of the soaking liquid and set aside. 2. Heat 1 tablespoon of the olive oil over medium-high heat in a large, heavy nonstick skillet. Season the chicken with salt and pepper and brown, in batches, for 5 minutes on each side. Transfer the chicken pieces to a bowl as they are done. Pour the fat off from the pan and discard. 3. Turn the heat down to medium, add the remaining oil and the onion, carrot and celery, as well as a pinch of salt. Cook, stirring, until the vegetables begin to soften, about 5 minutes. Add the garlic, parsley, rosemary, red pepper flakes and salt to taste. Cover, turn the heat to low and cook, stirring often, for 5 minutes, until the mixture is soft and aromatic. Stir in the fresh and dried mushrooms, turn the heat back up to medium, and cook, stirring, until the mushrooms are just tender, about 5 minutes. Season with salt and pepper. Stir in the wine and bring to a boil. Cook, stirring, for a few minutes, until the wine has reduced by about half. Add the tomatoes and salt and pepper to taste. Cook over medium heat for 5 to 10 minutes, stirring often, until the tomatoes have cooked down a little and smell fragrant. Stir in the mushroom soaking liquid that you set aside. 4. 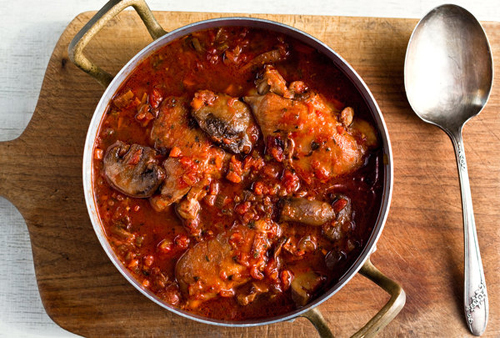 Return the chicken pieces to the pan and stir so that they are well submerged in the tomato mixture. Cover and simmer over medium heat for 30 minutes, until the chicken is tender. Taste, adjust seasoning and serve with pasta or rice. Yield: 4 to 5 servings. Advance preparation: The dish can be made through Step 3 and held on top of the stove for several hours (refrigerate the chicken). The entire dish can be made a day or two ahead and reheated. It will keep for about 4 days in the refrigerator and freezes well. When you run out of chicken but still have that luscious, gutsy sauce, use it as a sauce for pasta or a topping for bruschetta. Variation with kale: Blanch a bunch of stemmed, washed kale for 3 or 4 minutes, transfer to a bowl of cold water, then drain and squeeze out excess water. Chop coarsely. Add to the pot after the chicken has simmered for 20 minutes. Simmer for another 10 minutes or until the chicken is tender. Nutritional information per serving (4 servings, using 3 legs and 3 thighs): 363 calories; 15 grams total fat; 3 grams saturated fat; 3 grams polyunsaturated fat; 8 grams monounsaturated fat; 115 milligrams cholesterol; 18 grams carbohydrates; 4 grams dietary fiber; 165 milligrams sodium (does not include salt to taste); 35 grams protein. 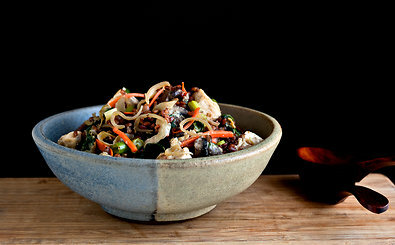 Mushrooms and barley are a classic combination, but brown rice is also very nice with this dish, and it cooks faster. 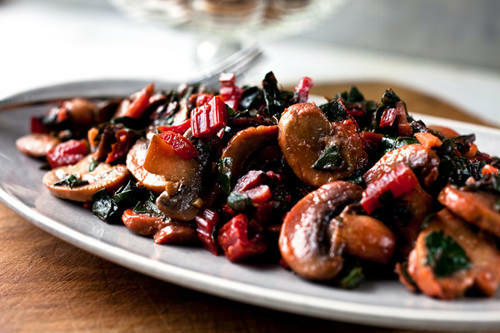 Whichever you use, simmer the grain in abundant water and used the drained water to moisten the mushrooms and chard. 1. Combine the barley or rice and water in a medium saucepan and bring to a boil. Add salt to taste, reduce the heat and simmer the barley for 1 hour, brown rice for 35 to 40 minutes, or until tender. Set a strainer over a bowl and drain the grains. Retain the cooking water. 2. While the grains are cooking, stem the chard and wash thoroughly in two changes of water. Chop coarsely. If the stalks are merely thick, dice them; if they are stringy, discard them. 3. Heat 1 tablespoon of the oil over medium-high heat in a large, wide skillet or wok. Add the mushrooms and chard stems, if using, and cook, stirring often, until the mushrooms sear and begin to soften, about 3 minutes. Add the garlic, thyme and a generous pinch of salt and cook, stirring, until fragrant, about 30 seconds. Stir in the chard and raise the heat to high. Cook, stirring, until the chard wilts, which shouldn’t take more than 3 minutes (you may have to add the chard in batches, depending on the size of your pan). Season to taste with salt and pepper. 4. Once the chard has wilted, add 3/4 cup of the cooking water from the rice or barley. Cover and simmer over low heat for 3 minutes, or until the chard is tender. Uncover, stir and if you wish to have more sauce with the vegetables, add more cooking water from the grains and stir until it reduces to the desired consistency. Taste and adjust seasoning. Drizzle on the remaining oil and serve with the grains. Advance preparation: You can cook both the grains and the vegetables several hours ahead and reheat. Retain some barley water or rice water to add to the dish if desired. The cooked grains will keep for 3 or 4 days in the refrigerator, but the cooking water will keep for only a couple of days. These dishes, known also as strata, can be rich, but they are just as satisfying when made with low-fat milk. The formula works well for any number of cooked vegetables tossed with stale bread and mixed with milk, eggs and cheese. 1. Bring a medium or large pot of water to a boil, salt generously and add the kale. Cook 2 to 3 minutes, until tender but still colorful. Transfer to a bowl of cold water, then drain and squeeze out excess water. Chop coarsely and set aside. 2. If using garlic, cut one of the garlic cloves in half and rub the slices of bread with the cut side. Then mince all of the garlic. Cut the bread into 1-inch squares. 3. Heat the oil over medium-high heat in a heavy, wide skillet and add the mushrooms. Cook, stirring often, until they begin to soften, and add the thyme, garlic and salt and pepper to taste. Continue to cook for another minute or two, until the mushrooms are tender and fragrant. Stir in the kale, toss together and remove from the heat. 4. Preheat the oven to 350 degrees. Oil or butter a 2-quart baking dish, soufflé dish or gratin. 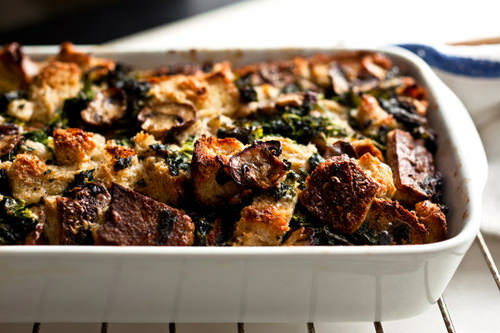 In a large bowl, combine the bread cubes, the mushrooms and kale, and the two cheeses and toss together. Transfer to the prepared baking dish. 5. Beat together the eggs and milk. Add salt to taste and a few twists of the pepper mill, and pour over the bread mixture. Let sit for 5 to 10 minutes before baking so that the bread can absorb some of the liquid. 6. Place in the oven and bake 40 to 50 minutes, until puffed and browned. Remove from the oven and serve hot or warm. Advance preparation: This can be assembled through Step 4 hours before beating together the eggs and milk and completing the casserole.